We did it! 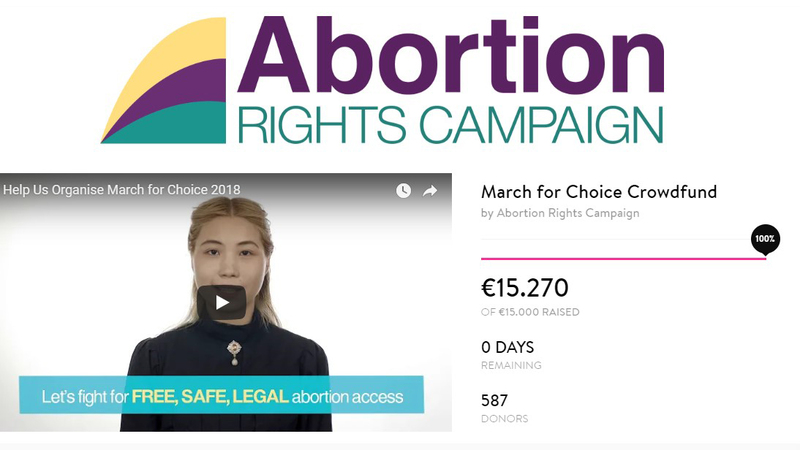 Last Monday, you helped us get over the line and together we have raised €15,270 for this year’s March for Choice. Thank you so much for all the love and support you have shown us during the crowdfunding week. You have made generous donations, shared our social media posts, and spoken to friends and family about our urgent appeal. As we read the hundreds of heartwarming comments from you, we were encouraged more than ever to keep up the fight for Free, Safe, Legal abortion access. As planned, €10,000 of the funds will be used for an accessible stage, high quality sound system, dedicated area at the front of the stage for people with mobility and sight interpretation needs, and essential event logistics such as hiring road barriers and renting a venue for stewards training. The other €5,000 raised on our stretch goal will allow us to print and distribute March leaflets and small posters around the country, and to afford online and print advertising. Please stay tuned on our website and social media for updates about the March for Choice, and if you haven’t signed up to our mailing list, you can do so here on our website to get the latest news and notifications on events, fundraising, and volunteering. You can further support us by volunteering to help with organising the March for Choice, joining one of our Working Groups, and giving regular donations on our website. We hope to subsidise regional buses to bring people to Dublin for the March with any extra funds after the essential and advertising costs of the March, and our stigma-busting and public engagement work goes on all around the year, so help is always needed and appreciated. And please don’t forget to tell everyone to come to the March for Choice on the 29th of September! We hope to see you there.